This week we're taking a look at some new titles from Sylvan Dell Publishers that involve numbers. And animals. Which is why we like Sylvan Dell so much. No other publisher that I've seen consistantly works with authors and illustrators to prompt a love of learning in children through their use of things that children love - cuddly bears, mysterious ocean life, elephants and birds, lizards and pelicans and the list goes on and on. This publishing house seems to know that if children can connect to animals, they will connect to the lessons that the book is also trying to teach. Smart move! 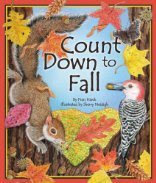 Just in time for the upcoming school season, they've released Count Down to Fall . This book is written in rhyme and it counts down from ten to one. The primary purpose of this book is to learn to count to ten (or backwards from ten) and to learn how to identify leaves from various trees. All of the animals that you see pictured in this book are engaging in some kind of activity around a leaf. For example we see a turtle munching on a chestnut tree leaf. Squirrels are scurring through oak leaves in search of acorns, and owls are sitting next to maple leaves. The back of the book contains two pages of information on trees, their leaves, seeds, fruits, nuts, roots, etc. There is a page which shows the differences in the shapes of leaves as well, and it also includes a matching game for children to play with the leaves. Very practical and fun - esp. if you are planning a leaf rubbing with your children! We never did make it to the zoo this summer, as I had hoped we would. Instead we've had to content ourselves with books on zoo trips and zoo animals. In What's New at the Zoo? An Animal Adding Adventure we learn to add. This book is a bit above where we're at right now, so we just spent our time looking at the animals and counting them out. However, the book is laid out so that the children can solve additional problems by counting the animals so we're not too far off the mark here! THe book begins with 2 + 1 and continues on up to 12 + 8. You count pandas, peacocks, snakes and bats. My son, being fascinated with the idea of the zoo (one day we'll take him there - really!) loves this book. He likes flipping through it. It's a bit hard for him to distinguish some of the animals from one another towards the end of the book. For example, there are 20 bats and they are all brown and they kind of blend together making it hard to point them out individually. But he's only 2 and I imagine a kid who was a little bit older than that wouldn't have as much trouble. There almost doesn't seem like there's anything new to say when it comes to raving (in a positive way) about Sylvan Dell. However, let's add generosity to the list. Sylvan Dell has offered one copy of each of the above titles to a Reading to Know reader. So leave a comment here if you'd like to win these books! Must be a U.S. Resident only and, per usual, my rule is that if you are a regular subscriber and track with me around here, you can leave two comments to equal two entries. (Faithfulness IS rewarded! ha) Contest will close on Wednesday, August 5th. Here's a special treat, if you don't mind reading books online! Sylvan Dell is offering you a chance to view ALL of their titles. For more information about this special treat, visit Sara Dobie's blog by CLICKING HERE. Hey, Kate! Don't enter me in the drawing :) I have these books on my desk right now! That being said, I want to send a BIG thank you from the Sylvan Dell family. We're so happy to have your support. Keep up the great work, and I hope you enjoy the free eBook trial for the next 90 days! Oh, please enter me in this drawing. As a teacher and mom I love children's books. Thanks. Oh, I visit you regularly. I get your daily subscriptions in my box. Love to keep up with you. Thanks for the second bonus. Win a book? Please enter me! 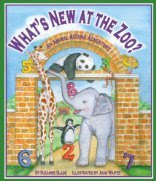 These look great, especially the zoo book for fun basic addition facts. Please enter me, too. Ooooh, I have munchkins that would love the looks of both of those books! Okay, I'll bite! :-) These look like tons of fun, Carrie! Of course, I'm commenting again! :-) Thanks for a great contribution to Read Aloud Thursday! My kids and I would love these books. I especially LOVE fall and books with fall illustrations are a real treat. Awesome book giveaway! And as usual excelent review! Kids love to be read to at any age--even the older ones! Please enter me. Thank you. Dear Carrie, The Sylvan books sound perfect for teaching one of my homeschool kids basic math problems, plus they could also be used for science. . Thanks for reviewing them. My kids would LOVE these books!!! THese books look great. Please enter me. Count me in! I love reading your blog! I teach kindergarten. These would be great! I follow and read regularly!! These look like great books. Thanks for the chance to win.